Garlic is traditionally used for cardiovascular health with evidence that it may help to maintain normal cholesterol levels in the circulation, when part of a healthy low fat diet. Studies have also shown that it has significant anti-fungal activity. Indeed, according to some practitioners garlic has been found to be more effective at reducing levels of Candida albicans (the yeast that causes vaginal and oral thrush) than some of the conventional treatments. 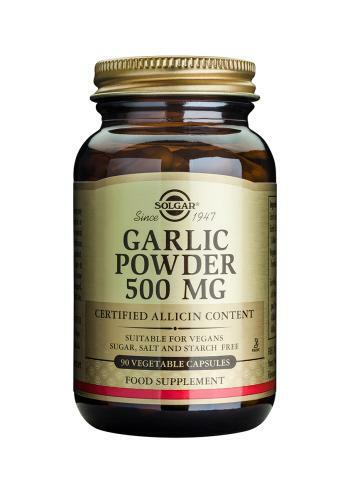 As a food supplement for adults, one (1) or two (2) vegetable capsules of Solgar Garlic Powder daily, preferably at mealtime, or as directed by a healthcare practitioner. Solgars Garlic Powder is produced from garlic bulbs that are grown without the use of artificial pesticides and fertilizers and are certified by Quality Assurance International to be in accordance with their standards.